Bd. Adolphe Max 107, 1000 Bruselas, Belgica. Próximo al Centro de Exposiciones, Proximidad a la estación, Parque, Centro ciudad, Zona de museos, Proximidad al casco antiguo, Proximidad al aeropuerto, Próximo al metro / tranvia, Centro comercial. Mas de 2 dias antes de la llegada : sin costes de cancelación. Menos de 2 dias y mas que 1 dia(s) antes de la llegada: 1 noche debe ser pagada. Menos de 1 dia(s) antes de la llegada : 2 noches deben ser pagada. Cuando la reserva no se ha utilizado y no se ha cancelado deberan abonarse las 2 primeras noches. Menores de 12 año(s) : gratis. Para Mayores y adultos: supplemento de 25.00 € por cama adicional. PUBLIC TRANSPORTS Brussels National Airport – 12 Km. Nearest Train Station : Nord – 0,5 Km – 5 minutes walk. Nearest Metro/Tube : Rogier – 50 meters - 2 minutes walk. POINT OF INTEREST Grand-Place : 1 Km - 10 minutes walk. European Parliament and Commission : 4 Km – 10 minutes drive. Heyzel Exhibition and Congress Centre : 6 Km - 15. You can reach the Hotel President Nord: By train: • From the Gare du Midi (Eurostar / Thalys terminal): Take the tramway number 3 direction "Nord". Get off at the "Rogier" station and take the Boulevard Adolphe Max. The hotel is situated on the left hand side of the Boulevard Adolphe Max at some 50 metres from the "Place Rogier". 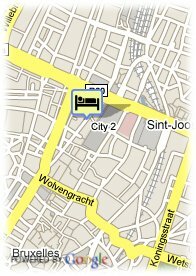 Another way is to take a taxi : driving time : 10 minutes / approximate cost : 10.00 euro. • From the Gare du Nord: Follow the directions for the city centre/ Rogier. Cross the "Place Rogier" at the Botanical Gardens and follow the Boulevard Adolphe Max. 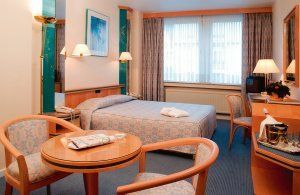 The hotel is situated on the left hand side of the Boulevard Adolphe Max at some 200 metres from the Botanical Gardens. By plane: • From Brussels National Airport: a regular train service connects the airport with the train stations (3 trains per hour). Get off at the "Gare du Nord" and follow the directions for city centre/ Rogier. Cross the "Place Rogier" at the Botanical Gardens and follow the Boulevard Adolphe Max. The hotel is situated on the left hand side of the Boulevard Adolphe Max, some 150 metres from the Botanical Gardens. Another way is to take a taxi : driving time : 20 minutes / approximate cost : 30.00 euro. By car: • Via the freeway E 19 from Paris: Drive along the Ring until you arrive at the exchange crossing Brussels (Koekelberg) – Ostend - Mons/Bergen. Take the exit 10 direction Brussels/Koekelberg. Follow traffic up to the Basilique – it is a big Church. You are Avenue Charles Quint. Take the tunnel (very long) and take the exit "Centre/Centrum/Rogier/Botanique". Follow the traffic up to the 4th traffic light and turn right. You will be on Boulevard Adolphe Max, drive a bit further and the hotel is situated at some 30 metres on the left hand side of the street, at the next corner. • Via the freeway E40 from Liege : Drive up to the end of the Freeway E40 and take the exit "Centre Bruxelles" and follow the directions "Centre/ Rue de la Loi" till the Schuman Place. Take the Rue de la Loi and drive all the way down. At the crossing turn right and take the tunnel until the 3 rd exit " Rogier/Jacqemain/pte Anvers". At the traffic light take the main road situated on your left hand side and parallel to the street you are. Continue straight until the second traffic light and turn left. You will be on Boulevard Adolphe Max. Drive a bit further and the hotel is situated at some 30 metres on the left hand side of the street, at the next corner. • Via the freeway 19 from Amsterdam: Drive up to the end of the Freeway E19 and follow the direction "Paris-Gent" via the ring. Drive along the Ring until you arrive at the exchange crossing Brussels (Koekelberg) – Ostend - Mons/Bergen. Take the exit 10 direction Brussels/Koekelberg. Follow traffic up to the Basilique – it is a big Church. You are Avenue Charles Quint. Take the tunnel (very long) and take the exit "Centre/Centrum/Rogier/Botanique". Follow the traffic up to the 4th traffic light and turn right. You will be on Boulevard Adolphe Max, drive a bit further and the hotel is situated at some 35 metres on the left hand side of the street, at the next corner. Edificio de estilo Art Deco con sus 101 obras de arte originales. Situado en el corazón de Bruselas.